Importing a dog from Europe – part 2. How much does a Doberman puppy cost in Europe? (updated 2019). Cheap Doberman puppies often end up being expensive dogs. Out of all the dogs I had in my life – even well-bred dobermans were the most “high maintenance” health wise. Read previous post about importing a dog from Europe: part 1 – how to find a breeder in Europe. 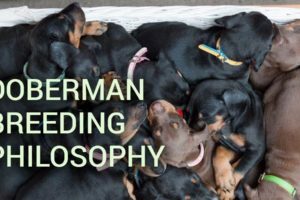 Make sure to do your homework – understand Doberman genetic diseases, and more importantly – understand heredity in the pedigree of your prospective puppy. Visit our Puppy for sale page to see pre-screened litters that we recommend. Overall the cost of dogs is cheaper in Europe than in the US. The dogs are true to the initial breed purpose than those in the US. 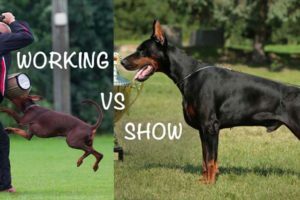 European clubs require mandatory temperament test for all breeding dogs, which helps maintain stable temperament in Doberman population (read article “American vs European Doberman“). Breeding in the US is more consumer driven and there is no breeding regulation as long as bred dogs are of the same breed. There are more activities for dog owners in Europe and dog owners are in general more pro-active with dogs – shows, sport trials, training available for any breed. If you go to a breed specific show in Europe you are likely to see dozens and hundreds of dogs. While in the US – you are lucky if there are 15 dogs signed up. European parents of my dogs were competing in dog shows among a hundred or so dogs in a conformation show. Can you imagine the competition? In the US – when I was showing my doberman – he was the only dog in his class. Doberman puppy cost (as of 2015) comparison is as follows (from cheap to expensive): European breeders of European dogs, American breeders of American dogs, American breeders of European dogs. American doberman puppies cost between $1500 up to $3,000 (and we only discuss prices from reputable breeders here). The lowest cost is for “pet puppy”. Such puppy will be fixed (spayed/neutered) and has a certificate of origin. The show quality puppy is the most expensive; the puppy will be intact, has a proper pedigree, but the dog will be co-owned with the breeder (you won’t be able to breed the dog without breeder’s permission). I knew enough about the differences between American vs European dobermans at that point to know that the best fit for me is a European Doberman. The cost of European lines doberman puppies in America is ridiculous. I found one website that was offering the pups for over $4500. The average price for European dobermans bred in America was starting $3000 and up. So it was only logical for me to import a dog from Europe. My dobbies were from Poland. The cost in 2014 was 1100 Euros plus 100 Euros per month to hold a puppy an extra month. In 2019, we’ve posted a new article with prices in several countries. 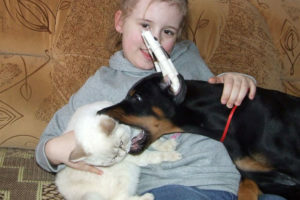 Read the Doberman puppy price article. Next article in this series is Importing a dog: mistakes to avoid when traveling with dogs internationally. You might also find helpful How to raise a doberman puppy – first days at home.